So you want to have the best of both citizenship: Filipino and Canadian? Well why wouldn’t you. Did you know that you need a visa to travel in Asia as a Canadian passport holder but not if you have a Philippine passport. Using either one of the passports are one of the perks of having dual citizenship. 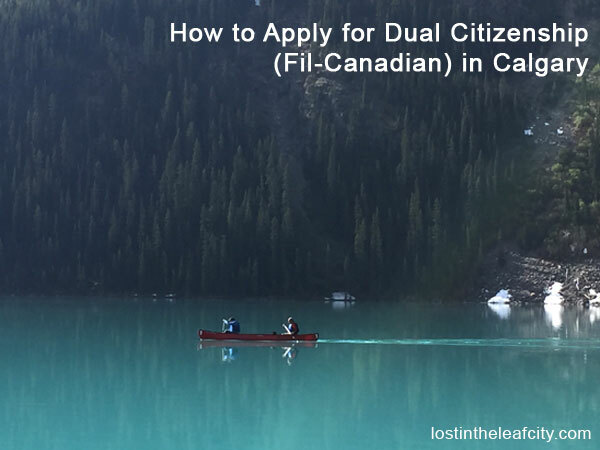 If you are sold to the idea of becoming a Fil-Canadian, in this post, I’ll show you how to apply for dual citizenship in Calgary, Alberta. No worries if don’t live in the Stampede City (but you should probably consider or have a visit); you can still apply for dual citizenship in and outside Canada. You have three choices; for Calgarians, keep on reading. You can apply in person for dual citizenship at the Philippine Consulate General in Calgary as a walk-in applicant or in one of the Consular Outreach Missions of the Consulate in Alberta and Saskatchewan. Step 1: Go to the Philippine Consulate General in Calgary. Step 2: Sign in the log book (for notarized documents, dual citizenship, Special Power of Attorney, NBI Clearance, etc.) and wait for your name to be called. Step 3: Submit the complete requirements and choose from the available dates (weekdays only) for the Oath Taking ceremony. Step 4: Pay the processing fee at the cashier. Step 5: Be proactive. Get application forms for Philippine passport and Overseas Absentee Voting (OAV) before you leave. It saves you time and printer ink. The process wouldn’t take long but it would be best to apply for the dual citizenship in Calgary early in the morning so you can have a chair to seat on. Later in the afternoon, you’ll have to compete for space and oxygen with passport applicants. And they do come in droves. To qualify for the Oath Taking ceremony, you should submit the complete requirements. Birth Certificate authenticated by the National Statistics Office (NSO). Get a birth certificate online. Dependents do not need an application form because they can apply together with the parents. Their information is added in the application form of the adult. But what if a child (below 18) would apply for dual citizenship without the parents application? Make a comment and share your experience about it. Although Applying for a dual citizenship in the Philippine Consulate General Calgary is easier than the journey towards Canadian citizenship, the responsibilities that comes with it are the same (minus the allegiance to the Queen). We should exercise our right to vote though it is more challenging for Filipinos living abroad. With your application on its way, get used to the idea of introducing yourself as Fil-Canadian with pride. Or wear a shirt with Philippines or Canadian flag. Or put a sticker on your car.